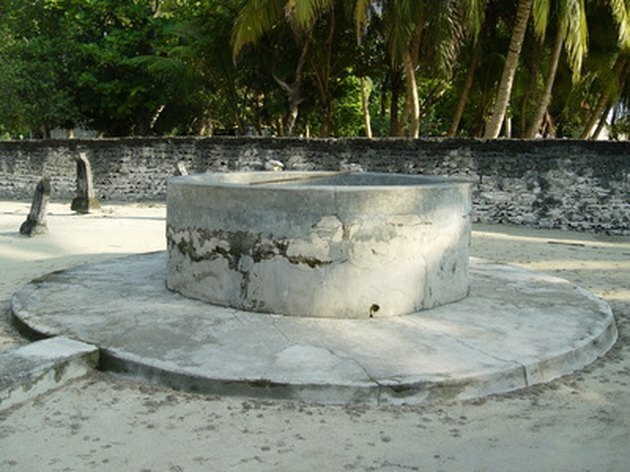 A well is a system used to draw water up from an underground water source. Usually, a hole is drilled into saturated soil or rock, with a pipe inserted to draw water to the surface. Many residential and commercial buildings in rural areas rely on well water systems because they have no connection to municipal water and power supplies. Wells use water stored in an underground aquifer, which, according to the Canada Mortgage and Housing Corporation, is a formation of rocks or loose material that produces a significant amount of water when tapped by a well. Bored wells are used for shallow or surface water wells. These wells rely heavily on precipitation to avoid running dry. Deeper wells are usually drilled, which costs more to construct, but provides safer water and less chance of running dry due to the level of the water table dropping below the level of the well. There are a number of signs given by the Water Systems Council that show a well is running dry. A simple signifier that a well is dry is that when the faucet is turned on, no water appears, showing that the pump is sucking air from the well and not water. The appearance and taste of the water can also provide clues to water levels. The Water Systems Council explains that water can appear murky or muddy, with an altered taste. A spluttering faucet with intermittent water is also a sign of the pump attempting to draw water from the well but finding mostly air. To ensure these are signs of a low water level and not problems with the electricity supply or fuses connected to the pump, the Water Systems Council recommends measuring the level of water in the well to confirm low levels. There are a number of reasons why a well runs dry or has a reduced water level. Often pumping rates for a well are greater than the supply of water available and the speed water is recharged. During water shortages, it is common for the water table level to drop below the level of the pump pipe, and the well screen becomes blocked by fine particles such as sand. What Causes Air in the Lines of a Well Water System?